Wrought iron is an alloy of iron with a very low content of carbon. The property of this material is that it is tough, ductile, malleable and easily welded so this alloy finds its use mainly as a building material for furniture. Previously wrought iron was used in the formation of many materials such as swords and cutlery before the development of methods of steelmaking. In the modern times, Wrought Iron Furniture has become very popular for the elegance they provide to the house because of their unique and classy style. But not only that, this furniture has some special benefits. Wrought Iron Furniture does have some special benefits. Two best things about this particular item are that it is weather resistant and it is durable in nature. So the longetivity is also more and the product remains elegant and beautiful for a long time. Moreover this furniture can carry any weight and size and cannot be destroyed easily. In short furniture made of wrought iron does last long. A lot of furniture is made of wrought iron such as wall hangings, shelves, candelabras, iron patio sets, pot racks, wicker chains and many more accessories. Since these furniture are very attractive in nature they need to be maintained accordingly. Unlike furniture made of wood and iron, this furniture needs not to be polished but some cleaning procedure is always required. To remove the necessary dirt accumulated on the furniture, dusting with a piece of wet cloth can give the furniture back its attractive look. In fact Wrought Iron Furniture should be properly painted to avoid getting scratched very easily. Beds are usually made up of wrought iron because it has a low corrosion rate. These beds are more costly than iron beds and do last long. A number of unique designs are available in beds made up of wrought iron and it usually adds a different look to your bedroom. Unlike iron beds, ugly patches are not formed on these beds due to its resistance to corrosion and rusting. Readymade wrought iron beds are available in the market but they can be also made according to the wishes and design of the buyers. Different types of wrought iron tables and chairs are available in the market. These wrought iron tables and furniture are available in wide range of colors and styles and also in many designs. The best advantages of these tables and chairs are that it goes with any furniture and is usually space saving furniture. 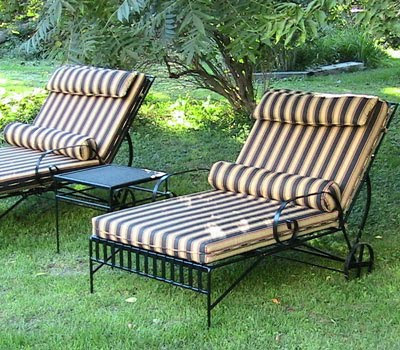 Many Wrought Iron Furniture Manufacturers are available in the market and they provide you with a lot of options when it comes to Wrought Iron Furniture. Different color, styles, latest trends and designs are available in these types of furniture.